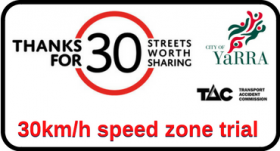 The City of Yarra, just north of Melbourne’s CBD, will trial 30km/h speed zones in an effort to make their street safer for everyone, especially vulnerable cyclists and pedestrians. This trial is address an alarming rate of crashes occurring within the Council footprint. “One hundred crashes occurred within the new speed zone between 2012 and 2017. More than 90 per cent of the crashes involved pedestrians, cyclists and motorcyclists.” City of Yarra mayor Daniel Nguyen. The Amy Gillett Foundation is in full support of this trial. Lower speeds make the roads safer for everyone, especially vulnerable cyclists. 30km/h speed limits are being introduced across the world. 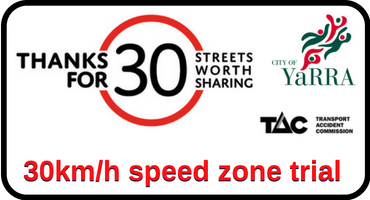 We congratulation the City of Yarra on trialling 30km/h and encourage other councils to adopt this important road safety measure. The year-long trial will commence in September and is supported by Transport Accident Commission.